It seems that this year's holidays would be rather bountiful, all thanks to the new online campaign that is going to be introduced by the Platinum Reels. 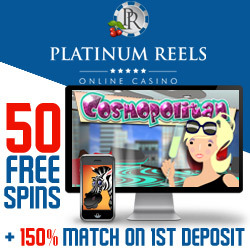 The online casino has been always known for its generosity and with such a special time of the year, there is nothing better than let yourself get something nice from the daily prizes that you might win at the Platinum Reels casino. Spend the next Thanksgiving at this online casino and you will be ready to put a huge turkey on your table, along with plenty other goodies that might still be acquired with such a reward. From the 9th until the 26th November, there will be lots of daily bonuses and prizes to the participating players, who are welcome to the great Holiday Harvest. During that period of time, a special leader-board would be placed, in order to keep the track on your current position on this list. Accumulating points is done through actual wagers, so the more you wager on games, the more points you gather, thus guaranteeing far better chances at winning. An astounding amount of $10,000 in casino chips awaits for the winners who will share this prize accordingly to the positions they get in the upcoming competition. Top 15 of the players from the leader board can expect to be rewarded at the end of the promotional period, which is the 26th of November 2015. Be mindful also to keep an eye for the cornucopia symbol, as it will appear randomly on the leaderboard page, providing a lucky bonus prize to those who spot it.